Dry shampoos are sure a godsend, but if you are not really comfortable with talc and synthetic ingredients, there are ways you can create your own. This means, you no longer have to shop for dry shampoo every time you run out, and you do not have to shell out money on it. 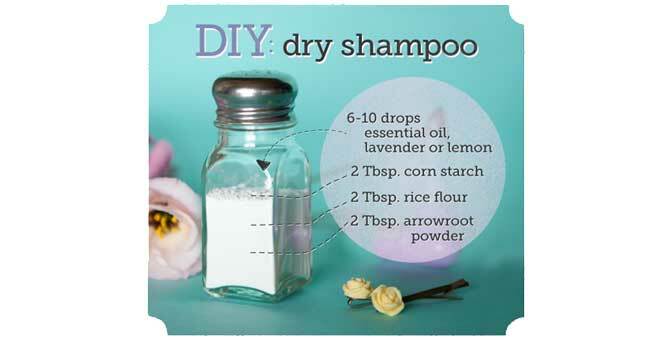 If you live in an area where dry shampoos are not easily available, your DIY dry shampoos can come in really handy. Here are some easy recipes of home made dry shampoos that you can use. To make this dry shampoo, mix together 1/2 cup of cornstarch with a tablespoon of baking powder. The cornstarch forms the oil absorbing base of your shampoo while the baking powder refreshes your tresses and deodorizes them. To add the smell of chocolate, just add some unsweetened cocoa powder to it. Make sure you use the unsweetened version because the sweetened one would make your head sticky and messy. Mix all these ingredients together and pass them through a sieve to ensure a smooth consistency. Now make a funnel with a round blotting paper and use it to pour this mixture into a container in which you would store the shampoo. Shake the bottle every time you want to use the shampoo. This is a great dry shampoo for dry hair, plus it smells great. For this shampoo, you need dry starch. Maize cornstarch works well. Use half a cup of it and mix in a tablespoon of baking powder. Mix well and add a few drops of lavender essential oil. Mix it well and use the back of the spoon to break any small clumps that may have formed. Use a blotting paper to blot out any moisture. Make sure that the shampoo is completely dry. You can store it in a bottle for future use. However, store this shampoo at room temperature and away from direct sunlight. If you have dandruff and need a dry shampoo that not only absorbs grease but also helps you with your dandruff problem, this is ideal for you. Combine a cup of arrowroot powder with two tablespoons of baking soda and mix well. Add a few drops of tea tree essential oil. This essential oil has antifungal and purifying properties. Mix all the ingredients well and break any clumps. If you do not have tea tree essential oil, you can also use any citrus oils like lemon or lemongrass, which have similar anti dandruff properties. Use a sieve to pass the powder through it. Ensure that it is completely dry and store it in a dark bottle away from direct sunlight. For women with very dry and damaged hair, a dry shampoo that can heal your strands and strengthen your roots is ideal. The powder base of this shampoo is similar to almost all other DIY dry shampoos. You take a cup of arrowroot or cornflour and add two tablespoons of baking soda. To this mix add a few drops of the essential oil of clary sage. Mix them well and blot out any excess moisture or grease from the essential oil. Use a funnel to pour the mix into a dark colored bottle for storage. Always shake the bottle well before each use. There are ways you can use your dry shampoo to clean your hair and refresh your mind. Since the shampoo goes into your scalp and hair, the right essential oil can really give you a kick at the end of a long, hard day. To make this shampoo, mix together half a cup of arrowroot or maize cornflour with a tablespoon of baking soda. Add a few drops of patchouli, ylang ylang or chamomile essential oils. All of these have a very relaxing quality and their aroma will certainly keep you going even beyond your normal hours. By the end of the day, your hair will be clean and you will still be relaxed.